There are some welcome chinks of light in today's magazines report for the last six months of 2013 by the Audit Bureau of Circulations, with pockets of notable growth for the newly combined print and digital figures. Under the new reporting rules, several brands posted large rises in consumers accessing magazine digital editions, with digital edition circulations as a whole up 61% year on year and the number of digital editions audited increasing by 52% to 185 (excluding international editions). At Condé Nast, whose international president, Nicholas Coleridge has been a vocal advocate of combining print and digital circulations, its magazine portfolio reports seven titles displaying digital edition and subscription growth. Women's monthly Glamour posted a new ABC of 415,258, an increase of 2.5% period on period. UK actively purchased sales have risen by 1.4% and total actively purchased copies are up by 2.8% period on period. Digital editions are up 4.4% period on period and 12.5% year on year. The fashion bible Vogue posted a new ABC of 201,077, with UK actively combined purchased copies up 5% period on period and 2.1% year on year. Digital edition sales have increased by 9.4% period on period and 124.5% year on year, while UK subscriptions have grown by 10.6% period on period. GQ continues to stand out in the men's sector, with a combined ABC of 127,040, representing an increase of 2.6% in UK actively purchased copies period on period. However, digital edition sales were up a rather sluggish 3.3% year on year. Elsewhere, Condé Nast's forward-facing monthly tech magazine, Wired, has a new ABC of 57,497, static period on period. Digital edition sales were up 1.4% period on period and 18.1% year on year. Coleridge, president of Condé Nast International and managing director of Condé Nast Britain, said: "It's great to see a surge in sales for Glamour in the past six months, and our titles making similar progress in digital editions. This is a terrific time to be publishing quality magazines." Hearst cited a "solid" performance for the six-month period, with 12 out of the 19 titles audited, posting either period-on-period growth or year-on-year growth. The publisher's flagship brand, Good Housekeeping, posted a combined print and digital ABC of 414,542, up 3.6% period on period and 0.4% year on year. Women's Health, launched in 2012, is up 4.5% period on period and 7.6% year on year to 112,512, while in the men's lifestyle market, Esquire was up 4.2% period on period. Hearst also reported "signs of stability returning to the weekly market", with its weeklies division growing total print and digital sales by 1.3% period on period, including Real People, up 6.7% period on period, Reveal up 2.4% period on period and Inside Soap up 2% period on period. Anna Jones, chief operating officer of Hearst Magazines UK, said: "It's an exciting time for our business. Our magazines continue to dominate their respective markets, while our fantastic digital growth and innovative new product launches, from Esquire Weekly to ELLE's new mobile proposition, enable us to deliver the highest-quality content to our audiences and advertisers across every dimension." 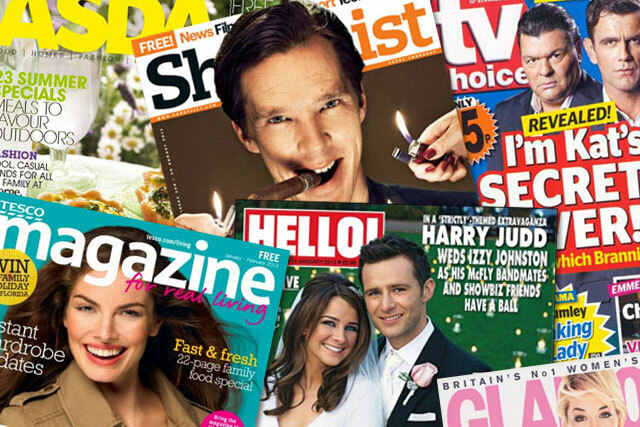 IPC Media reported "healthy growth" from some of its monthly and weekly women’s titles in both the lifestyle and real life sectors, with six titles posting lifts. In the weekly market, IPC Connect’s Woman’s Own outperformed the market both period-on-period (2.2%) and year-on-year (1.3%) with 226,116. IPC’s monthly lifestyle title Woman&Home reported print growth of 3.8% on the period and 0.2% on the year, to deliver a combined ABC of 356,282. Real life title Pick Me Up achieved a 5.5% uplift, posting a combined print and digital ABC of 183, 662, while Chat posted a 0.7% print rise to 331,102. At Bauer Media, home to Heat, Grazia and Empire among others, there is much talk of reaching "valuable audiences across multiple-platforms", with its celebrity leading Heat brand now claiming more than seven million consumer touch points across radio, magazine, TV, online and mobile. Paul Keenan, chief executive of Bauer Media, said: "Our ongoing commitment to product excellence is reflected in strong ABC performances from Heat, which outperforms the celebrity weekly market both period on period and year on year, Yours, which has had another strong period with continued stability, Garden News, which delivers significant year-on-year growth, and Classic Cars, which thanks to a fresh new look and new editorial franchises, shows a growth of +6.05% on last period." In the purely ad-funded sector, ShortList Media is celebrating solid performances for both its free men's weekly, ShortList, and its women's weekly, Stylist. ShortList's distribution held steady, with slight lifts of 0.04% period on period and 0.6% year on year, enough for the title to be able to claim its sixth consecutive year of ABC growth, at 534,692 copies per week. Publisher Darren Singh said: "ShortList's continued growth in the men's magazine market is proof that the right magazine, with the right distribution, can still reach a quality audience. It's clear that the modern, urban man wants a weekly title that he can relate to, be inspired by and read with pride in public. ShortList’s authoritative, intelligent and accessible tone offers the service these men are looking for to advise and entertain them. Stylist, the women's fashion and lifestyle market, posted its fourth year-on-year ABC increase, with an audited 435,975 copies every week. Publishing director Glenda Marchant said: "Stylist has had a fabulous six months, not only celebrating its 200th issue, but creating some amazing commercial solutions. An exciting partnership with Ford saw the phenomenal feat of creating an entire issue of Stylist in 24 hours from a pop-up "
Barry McIlheney, chief executive of the PPA, said: "Today's ABC release marks a significant development in the evolution of measurement for magazine brands. "The industry has long pushed for an appropriate metric that reflects the growing diversity of platforms and audience touch points, and this combination of print and digital edition circulations is a very positive step forward." More comment and industry poll here: Should magazines combine print and digital editions? Combined circulation chart, showing magazines which reported a print and a digital circulation. Magazines which did not report a digital circulation are not shown in this chart.